Speaking of Molly, she had an American Girl doll of a Native American girl. I took a picture of her outfit & I duplicated the necklace so she could dress up like her doll. 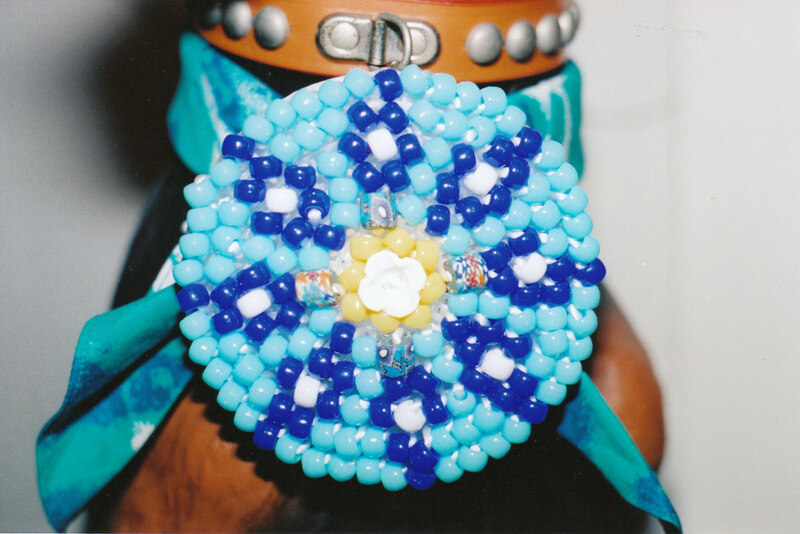 I had the beads, & button (center), & some large hole plastic canvas. I just had to get the 4 decorative beads (just outside of yellow ring of beads), & a bandana to match. In case you are wondering, you are looking at our “pet” doberman model the necklace for the picture. He’s really a life-size dog that is a statue & we bought a collar for with his name, Buddha, engraved on it. Repairmen are cautious when they first glance at him!